BRIAN BAKER/STREETER NO. 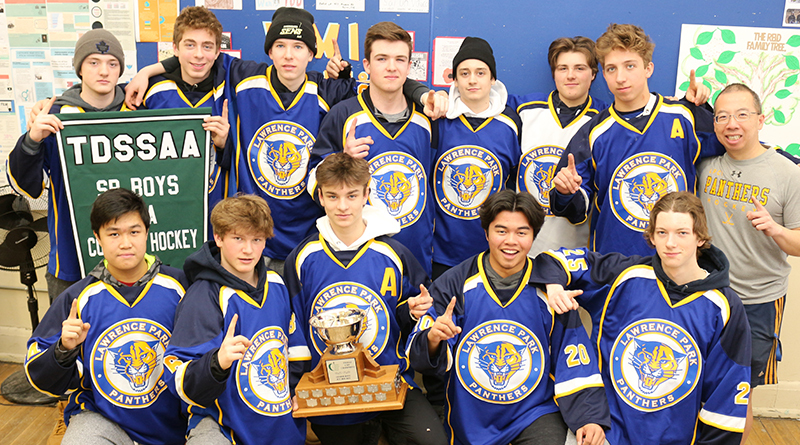 1 PANTHERS: The boys AAA hockey team from LPCI is heading to OFSAA after a long drought. It took only 12 skaters in triple overtime for Lawrence Park to oust Humberside in boys’ AAA hockey on March 1. Although they were gassed at the end of 38 minutes, the troupe of Panthers were ecstatic to be the first team to head back to OFSAA in some time. But the real adversity was surviving a 4-2 deficit heading into the third period. Recalling the game, coach Lindsey Wong is seated at a quad of tables, his charges Justin Avsenik, Kevin Doyle, Nick Enero and Wyatt Johnston hunkered in close. Wong shared his final words before the team went out onto the ice to get them to tie up the game and force a subsequent three overtimes before seizing the TDSSAA AAA hockey title on a game winner by Johnston. It was double the pleasure for the school’s hockey program, as the girls also beat Humberside in the city championship. But for the boys, who got a hat trick and an assist from captain Jaden Walters, that 5-4 triple overtime win was a testament to their band of brothers’ mentality. Most of the team is comprised of Grade 11s, and many of them are close friends off the ice. “The friendship will take us far,” Enero said. Unfortunately, a few will be graduating, like senior Avsenik, and a few more are seeking a shot at the Ontario Hockey League’s entry draft. Both Johnston, who is coached by Hockey Hall of Famer Paul Coffey, and Tucker Robinson will be taking that leap. But in the meantime, they’re ready to skate against anybody at this year’s AAA OFSAA tournament in Barrie. They’re first test will be the Brooklin Bears on March 20. “Whoever comes to the rink, we’ll take them on,” Doyle said.